I sure appreciate it when you share my recipes. Please use this image if you’d like to Pin it. Thanks! Can you tell that I’m a tropical mood? Kauai will do that to you! This Tropical Superfoods Salad came out of my desperation to use as much of our produce as possible on the last night of vacation, so we didn’t have to waste it. It was so good, though, I had to make it again when we got home! As a side note, how cute is that surfboard cutting board? Love it! I can’t get over how delicious the natural flavors of Hawaii are! I came home with a permanent craving for macadamia nuts, papayas, mangos, coconuts, sweet onions, and colored sea salts. I’ve called for mangos in this salad, but you can use any kind of fruit that sounds good to you. Papaya would be delicious! There are a few superfoods in this salad, but I want to focus our nutrition discussion on the macadamia nuts. Macadamia nuts have high levels of omega 3 fatty acids, but low levels of omega 6 fatty acids. If you eat too many omega 6 fatty acids, and not enough omega 3s, you will develop inflammation. These nuts can help balance out the high levels of omega 6s Americans tend to eat in their diets. They are also high in Vitamin B1, manganese, and copper. For more interesting information on macadamia nuts, check out this article. I do have to say one quick nutritional note on the Black Lava Salt. It is basically just sea salt, that has been treated with activated charcoal. The charcoal boosts sea salt’s natural detoxing properties. Before we get to the recipe for the Tropical Superfoods Salad, I want to invite you to join with others who are making healthy changes. I’d love to walk alongside you in your journey towards wholeness and health! Jesus said, “I have come that they may have life, and have it to the full!” Freedom from food addictions is part of having a truly full life. 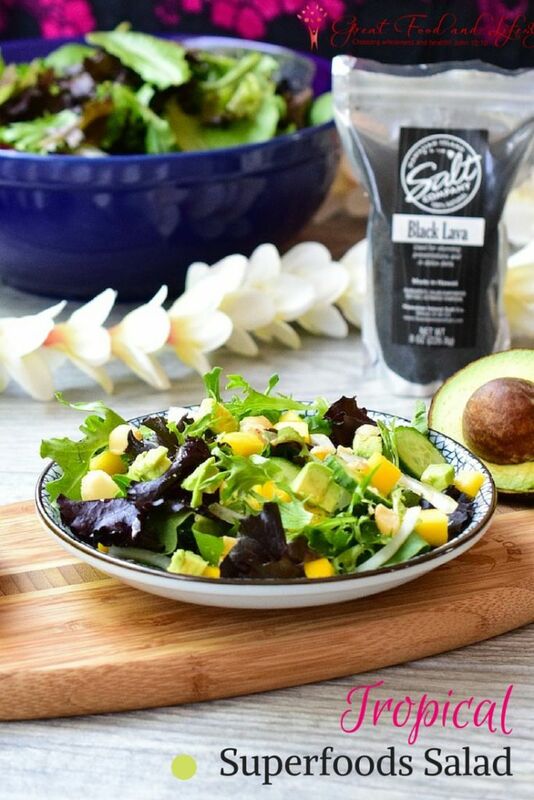 I developed the recipe for this Tropical Superfoods Salad in Kauai and simply had to share it! It is both vegan and paleo. To complete the meal add protein. Gather your fruits and veggies, and chop them into small pieces. Simply stir all of the ingredients together in a large bowl. If you make the salad ahead of time do not add the avocados until it is time to serve, or they'll turn brown. Enjoy! 3 Responses to "Tropical Superfoods Salad"